A person convicted of a felony is eligible for an additional prior record point if “the offense was committed while the offender was on supervised or unsupervised probation, parole, or post-release supervision, or while the offender was serving a sentence of imprisonment, or while the offender was on escape from a correctional institution.” G.S. 15A-1340.14(b)(7). I call that point the “under supervision” bonus point. 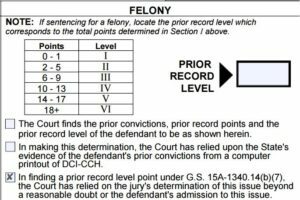 Though part of the defendant’s prior record level, the point is probably best thought of as an aggravating factor. A recent court of appeals case reminds us why. In State v. Crook, the defendant was convicted of several felonies. He had only one prior conviction that counted for a sentencing point—a DWI. He was apparently still on probation for that when he committed the felonies at issue in Crook, because he was also assessed the “under supervision” bonus point. That gave him two points, putting him in prior record level II. The court of appeals concluded that the point was not properly found. The court said the prior record level worksheet didn’t affirmatively show that the State had given the proper notice of its intent to prove the point, and the stipulation to the point was not clear evidence that the defendant had waived the notice. Because the improper bonus point raised the prior record level from I to II, the court remanded for resentencing. Crook may be a little surprising to some. Prior record level is generally something we think of as informal—often proved by stipulation, and even when disputed, proved to the judge by a mere preponderance of the evidence. As Shea noted in yesterday’s post, that’s generally fine, because prior convictions are exempt from Blakely v. Washington, 542 U.S. 296 (2004). But the under supervision bonus point is different. It relates to a person’s prior criminal activity (he was on probation because of a prior crime), but it is not itself a prior conviction. It requires proof of the person’s status as a supervisee, inmate, or escapee at the time of his or her present criminal activity—facts that have never been subjected to jury proof. Some court have held that these types of facts fall within the prior conviction exception to Blakely. See, e.g., United States v. Corchado, 427 F.3d 815 (10th Cir. 2005) (holding that a judge-found sentencing enhancement based on the defendant’s probationary status did not violate the Sixth Amendment). Some courts have concluded that they do not. See, e.g., Butler v. Curry, 528 F.3d 624 (9th Cir. 2008) (holding that the fact of being on probation at the time of the crime does not fall within the prior conviction exception to Blakely). Our legislature erred on the side of caution, including the under supervision bonus point within the same notice and proof requirements applicable to statutory aggravating factors, spelled out in G.S. 15A-1340.16: 30 days’ notice of intent to prove (-1340.16(a6)); and determination by the jury beyond a reasonable doubt (-1340.16(a5)) or admission taken under the procedures spelled out in G.S. 15A-1022.1 (-1340.16(a1)). If the defendant is going to admit to the point, he does not merely stipulate to it; he pleads guilty to it. The AOC forms reflect this understanding. What form does the State use to give notice of the under supervision point? The Notice of Aggravating Factors form, AOC-CR-614 (the prior record point portion is on the top of Side Two). What form does the court use to memorialize a defendant’s admission to it, including a waiver of notice, if any? The Transcript of Plea, AOC-CR-300 (#16 on Page One, Side Two). And if a defendant demands a trial on it, where does the court note that the jury found the facts underlying the point beyond a reasonable doubt? On the prior record level worksheet, by checking the box indicated below. I’ve said it before and I’ll say it again now: the “Stipulation” box on the prior record level worksheet can be a trap. It’s a trap for the under supervision point, as discussed in today’s post. It’s a trap when it comes to “substantial similarity” of out-of-state prior convictions, as discussed here. And it’s a trap when it comes to the other possible bonus point, the “same elements” bonus point, because that (like substantial similarity) is a question of law to which a person may not validly stipulate, as discussed here. To the extent that any of those issues are incorporated into the ultimate determination of the defendant’s prior record level, any purported stipulation to the level as a whole is ripe for challenge on appeal or through postconviction collateral attack. Any similar statute, due process argument, or AOC form that would give a similar notice requirement for misdemeanors? WHO DO I CONTACT TO GET OUTSIDE HELP IN MAKING SURE MY HUSBAND’S WORKSHEET FOR PRIOR RECORD POINTS IS CALCULATED CORRECTLY? My husband is currently incarcerated. He went before a Forsyth Co judge in January 2017. His Worksheet for Prior-Record Level was [we believe purposefully] miscalculated by the DA, which grossly misrepresented him in court before the judge for sentencing purposes. My husband was labeled a Level VI for Prior Record Level [giving him 20 points] when his lawyer now tells me he should have had only 10 -12 points and should be considered a Level IV. My husband goes back in for RE-SENTENCING on June 15th. I am looking for a Sentencing Expert, that may help me in interpreting his Prior Record Level Worksheet [all of his previous convictions are from FL] BEFORE this new court date. I need to know that what both the new DA and my husband’s PAID ATTY come up with are correct this time and not some fictitious piece of their imagination since BOTH admit to getting it wrong the first time. I realize now it was my husband’s atty’s job to KNOW his worksheet and to challenge any errors on it in January. This simply did not happen.